A sports reporter made sure he was on cue for a great interview when he met one of the world’s best snooker players. 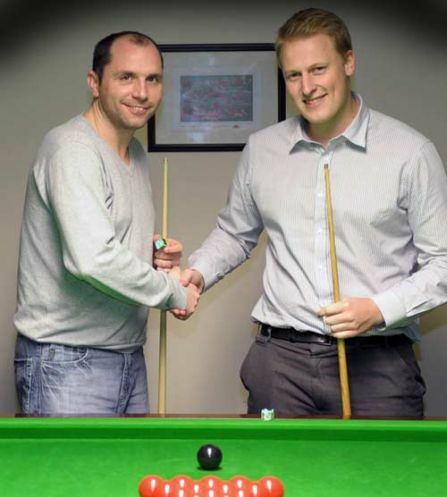 Rob Setchell, of the Cambs Times and Wisbech Standard, challenged snooker ace Joe Perry to a frame as he prepared for his recent World Championship qualifier. Joe ranked 26th in the world rankings and a professional for 20 years, has played countless frames across the world against the game’s legends. He reached the World Championship semi-finals in 2008. He regularly practices with world number three and 2010 world champion Neil Robertson. A converted snooker room at the back of Perry’s parents’ home was the setting for the clash which saw Joe cruise to a 61-18 victory. Said Rob: “For the space of about a minute, I was ahead against the world number 26. “That’s the small shred of consolation I can take from my 61-18 hammering at the hands of Gentleman Joe. “Playing on a table used in the 2003 World Championships, my early break of nine was never likely to give the snooker star a headache. Is that really a story? Shouldn’t the quote marks finish at headache? Or is the last line one of those invented quotes by Rob himself to fit some facts in? I liked the story so consider yourself snookered Jeff. Think you have put a big hole in bottom of barrel with this one! Dog bites man – no story. Man bites dog – story. Old adage but true. Now if Rob had won….